There is a range of strong opinions when it comes to Jewish community development east of the Green Line. Many around the world refer to these Israeli communities as “settlements.” But, to Avi Zimmerman of the Ariel Foundation and many Israelis, Ariel is something else. Zimmerman was born and raised in West Orange, N.J. He made aliyah in 1995 and served in the Israel Defence Forces. After earning a degree in occupational therapy at the Hebrew University and then working in the field for four years, he and his wife decided to move to Ariel. There, Zimmerman started up an aliyah program. Ariel will celebrate its 40th anniversary in 2018. Established on Aug. 17, 1978, with 40 families, it is now a city of close to 20,000 residents, plus an additional 15,000 students studying at Ariel University. Geographically, Ariel is east of Tel Aviv, past the Green Line. Given what he – and others – see as misinformation being spread about Jewish communities east of the Green Line, Zimmerman decided to share stories from the people actually living in the area and how local people feel about various issues. To do this, Zimmerman copied a format that has worked very well for TED Talks on YouTube, and created Talk17. “Our lives are not lived through a conflict lens, fortunately, nor are those of our Palestinian neighbours,” he explained. “Those elements possibly do exist. It’s not that they don’t exist. But, they are not the primary theme of the way life is lived here. “If people are interested in what goes on here, I think it’s only fair to the international community to provide more accurate information – not in terms of stats or facts, although that’s part of it … [but] beyond that, in terms of the voices from the region. Zimmerman chose the TED Talk format because it is not confrontational, as are debates and as can be panel discussions. The format allows a presenter to tell their whole story without interruption. “We want to give authentic voices an opportunity and a fair platform, so there’s no debate, no winners and losers, no questions and answers,” he explained. “There’s no objective right or wrong to that. It’s authentic…. I think, ultimately, people are interested in the breadth and depth of the story. 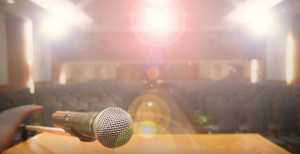 While an 18-minute video is hard for some people to get through, Zimmerman has been finding that, organically, Talk17 has been successful by having speakers who are on the frontlines of change-making. He gave as an example an exchange he’d had just before his interview with the Jewish Independent – an artist had happened upon Talk17’s Facebook page and was very excited about the concept. The artist runs an organization that uses the arts as a form of intercultural dialogue and they and Zimmerman are now working on plans for an arts-themed program, including an exhibition, at the end of April. While Palestinians, Israelis and Canadians are open to listening to talks in languages other than English, Zimmerman has found that Americans are less willing to do so. Because of this, he has decided to stick with English for Talk17. “We automatically limit ourselves to English-speakers,” he said. “They don’t have to be native English-speakers. We try to get a fair balance of Arab and Palestinian voices among the Jewish and Israeli voices. We try to get a fair balance of women and men. Zimmerman hopes that, by the end of the process, he will have been able to create a video archive that people can access to deepen and broaden the conversation about the region, so they can realize there is more to the story than they thought from just reading a short article or hearing a news clip. Zimmerman also hopes that, in the future, visitors to Israel will be more willing to venture out of Tel Aviv and Jerusalem, and will come visit Ariel to experience firsthand the beauty of the region and its people. “We all need to remember that, regardless of the terms of the deal that one day will hopefully be reached between Israel and the Palestinians, and regardless of where the lines will be drawn, Jews and Arabs will be neighbours forever,” said Zimmerman. “With that in mind, we need to figure out how to work with them directly, and we’d appreciate it if the world would allow us to do so, by appreciating the dynamics between us … by having this window into our interactions. 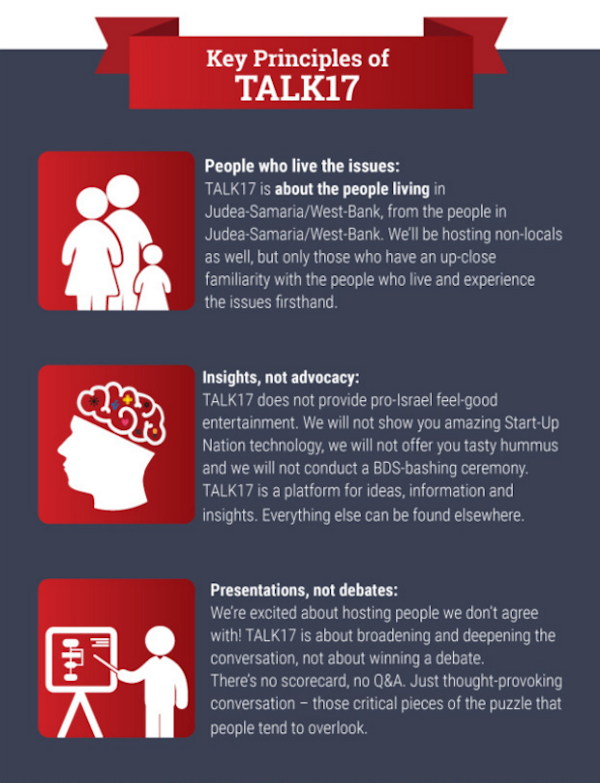 In addition to the Talk17 YouTube channel, there is a crowdfunding effort in progress for the talks, at generosity.com/community-fundraising/talk17-change-the-israel-conversation–2.